Earlier in May 1940 two infantry sections (70 men) were sent to the end of the dyke to prevent German landings beyond the vision of both fortresses. The Germans soon found out about these units and seven fighter aircraft strafed Dutch positions. One soldier and two civilians were killed, 10 civilians wounded. After this they were recalled to Kornwerderzand. Until May 12, the Germans had not tried to take Fort Kornwerderzand. However, that evening three soldiers were sent to see if the fort had been abandoned. They were pinned down by machine gun fire. Two were killed, while the third escaped. The Germans decided to take the fortress. They planned to launch Luftwaffe strikes, then an extended artillery bombardment by howitzers, after which they would send 500 soldiers. 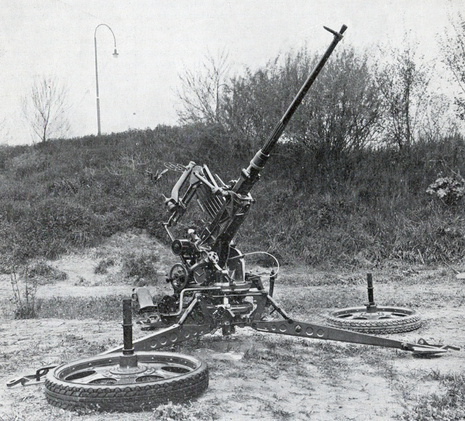 However, unknown to the Germans three 2 cm anti-air guns and 4 heavy anti-aircraft machine guns had arrived overnight at Kornwerderzand. The next day, pilots who had previously flown unchallenged were under fire. The Germans sent 62 planes to bomb the fort. The planes dropped five waves of bombs. Four planes were shot down and crashed into the sea. The bombardment was followed by an hour of heavy bombardment from the howitzers, but it had little effect on the heavily protected Dutch. As soon as the bombing stopped the Germans advanced down the narrow dyke. Captain Boers waited until they were within 800 metres, then ordered machine-gun fire, making it difficult for the Germans to withdraw. Most soldiers tried to hide, while a few managed to advance. The Germans were under constant fire for an hour and 20 minutes. When Boers ordered firing to stop, the remaining Germans withdrew - the assault had failed. During the night Boers ordered the dyke to be lit by flares and search lights so the fortress could not be attacked without Dutch soldiers knowing. On the early morning of the 14th the Germans once again fired their artillery at the fortress but overnight the Dutch had called in the gunboat HNLMS Johan Maurits van Nassau who returned fire with her 3 heavy 5.9" guns from her position in the Wadden Sea approximately 11 miles from the German positions. Fire directions came in from the fortress by telephone to Dutch Navy Command in Den Helder who forwarded them by radiotelegraph to the gunboat. This barrage silenced the German guns in less than an hour and dumbfounded the German commander General Feldt who was unaware of the presence of any Dutch artillery in the area, let alone this heavy calibre. In the North the assault to the screen-defences in front of the Afsluitdike, in the heart of the country the battle for the Grebbeline, in the south the many local battles of the French/Dutch formations against the advancing German armour and in the west the decisive battle on the Island of Dordrecht.